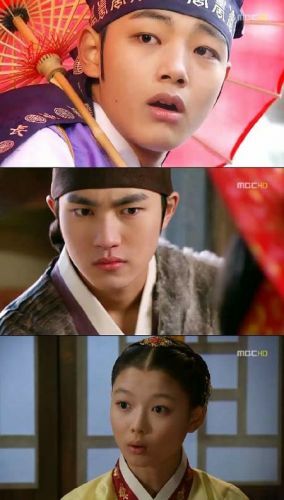 MBC TV’s Wednesday and Thursday drama series The Moon that Embraces the Sun (The Sun and the Moon) debuted on the night of January 4th, 2012, and has been gaining rare reviews from the viewers beginning from its premiere first episode. KBS 2TV’s Wild Romance and SBS TV’s Take Care of Us, Captain broadcast at the same time slot are not to be thrown into the shade either, successfully fired the first shot in the battle for ratings. The first episode of The Moon that Embraces the Sun is capturing audience’s attention with beautiful image of the charming characters and terse story development. The look of crown prince Lee Hwon (Yeo Jin Goo) who is young and has no sense that is always lively and mischievous, reminiscent of the warm bright sun. And the current him and adult Lee Hwon whose personality is completely changed is a stark contrast that raises the expectation of viewers to the role. The illegitimate son of the former king who is older than Lee Hwon for 2 years, the half-brother Prince Yang Myung (Lee Min Ho) is living outside the palace without any constraint. Although he is a man of great talent, but because of his nativity, he cannot show his capabilities. 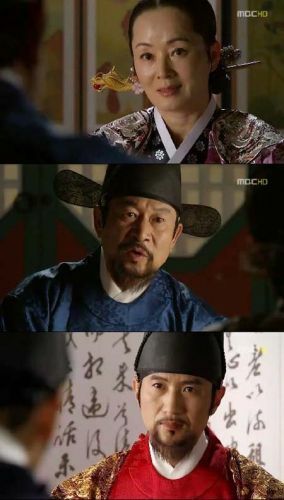 Prince Yang Myung also perfect portray the psychology of the role in the short appearance. The helmsmen of wife’s family interference in political affairs, wife of former king Queen Yoon (Kim Young Ae) and her uncle Yoon Tae Hyun (Kim Young Soo) are also plotting a sinister secret, indicating the love that happens under this situation by Lee Hwon and Prince Yang Myung to the woman they loved, Yeon Woo, is impossible to be smooth sailing. In order to expand his power, Yoon Tae Hyun is willing to do any means, and even tortures to death the dancer Ah Lee (Jang Young Nam) with unfounded accusation who got to know his conspiracy. On the one side is the story of bright and cheerful Lee Hwon, Yeon Woo and Prince Yang Myung; on the other side is the murderous Queen Yoon and Yoon Tae Hyun, while the person standing in the middle of the factions is King Seongjo (Ahn Nae Sang). The Moon that Embraces the Sun depicts both intense plot and warm story, and has been praised by audience. After the broadcast of the drama, many viewers left messages, “The time passed very fast,” “The acting of child actors is excellent,” “Everybody’s acting is good,” “Is a historical drama worth watching,” and so on.